The only baleen whales to spend their entire lives in tropical and subtropical waters, these great whales are over 44 tons of sheer awesomeness. 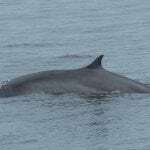 Both the identity and exact number of Bryde’s whales are a bit of a grey area. As well as ‘ordinary’ Bryde's whale found in the Pacific, Indian and Atlantic oceans, there are also one or more smaller forms who tend to prefer more coastal waters. 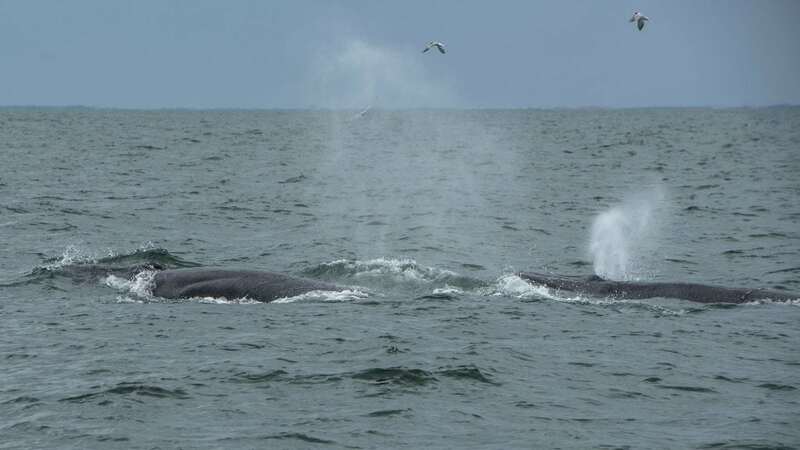 Currently though their status is unclear, with only two sub-species recognised for sure: B. e. brydei (offshore Bryde's whale) and B. e. edeni (Eden's whale). 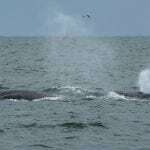 What do Bryde’s whales look like? The long and slender bodies of Bryde’s whales are a smoky blue-grey colour and often marbled with scars caused by parasites and cookie-cutter sharks. Each whale has a sickle-shaped dorsal fin about two-thirds of the way back along their body, and unlike other baleen whales, has three parallel ridges on the top of their head that make up a quarter of their entire body length. Filter feeders, they have between 40 and 70 throat pleats that allow their mouths to expand and 250 to 410 coarse baleen plates to sieve their food from seawater. 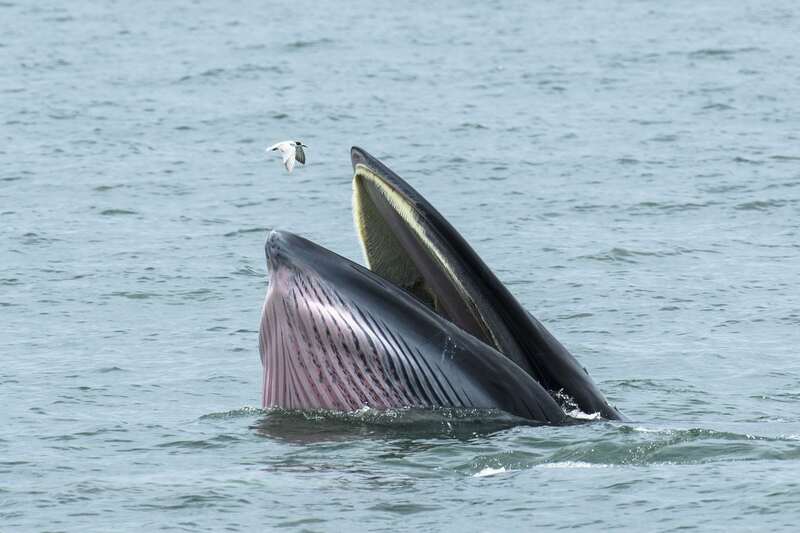 What’s life like for a Bryde’s whale? Bryde’s whales spend most of their time alone or in pairs, although larger groups have been seen feeding together. Their average speed is only a few miles per hour, but they can reach nifty speeds of up to 15mph if they need to. They’re also pretty nimble and can change direction rapidly both above and below water. According to recent research, Bryde’s whales like to spend most of their days hanging out within 50 feet of the water’s surface. As with the other large baleen whales, Bryde’s whales eat comparatively microscopic prey, mostly consisting of plankton, krill and copepods (tiny crustaceans). They also feast on bigger crustaceans such as crabs and shrimps, as well as a variety of small schooling fish. Bryde’s whales are found in every ocean of the world. However, as they prefer waters of 16°c or more, they limit their travel to within tropical, subtropical and warm temperate waters – the only species of baleen whale to do so. Some populations of Bryde's whales take such a liking to an area that they are considered ‘resident’, while other populations migrate away from the equator in summer and back again in winter. The name is pronounced 'Broo-dess'. The whales are named after Johan Bryde, a Norwegian who built the first whaling stations in Durban, South Africa in the early 20th century. How many types of Bryde's whale are there? 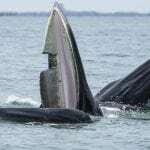 Scientists regard Bryde's whale as a species "complex". What this means is they are not really sure how many different types or sub-species there may actually be. 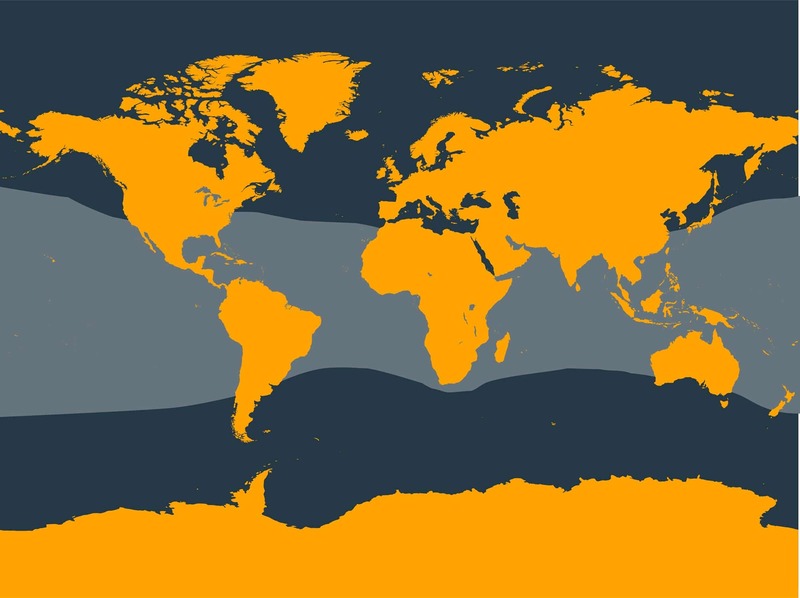 In addition to the "ordinary" Bryde's whale, with a worldwide distribution in the Pacific, Indian and Atlantic oceans, one or more smaller forms which tend to be more coastal in distribution have also been described. Currently, the status of the smaller forms is unclear and there may be several additional species and/or sub-species however for the moment, two sub-species are recognised; Bryde's whale and Eden's whale. WDC is extremely concerned about this downlisting. In December 2018 Japan announced its withdrawal from the IWC (the body that regulates whaling) and the intention to resume commercial whaling with Bryde´s whales amongst the target species. A signal of species recovery should not be taken as a sign that populations can withstand any level of commercial whaling, given the multiple other man-made threats, along with uncertainties around population structure and the health of that population. 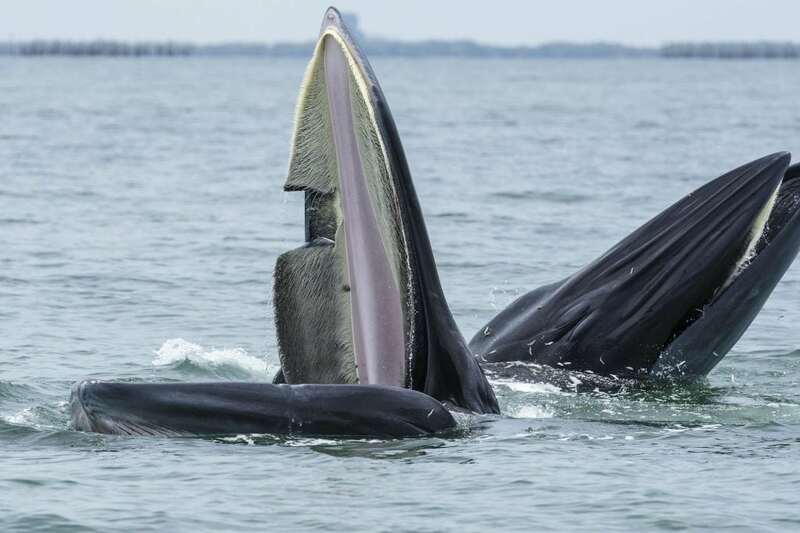 Bryde's whales face many threats from human activities. With so little known about exactly how many different species there are, and how small some populations may be, it is vital we protect these whales. Hunting – Bryde’s whales are hunted by Japan and opportunistically in a few other countries around the world. Pollution - toxic chemicals from plastic, litter and oil spills build up in Bryde’s whales seriously harming their health and their ability to have young. 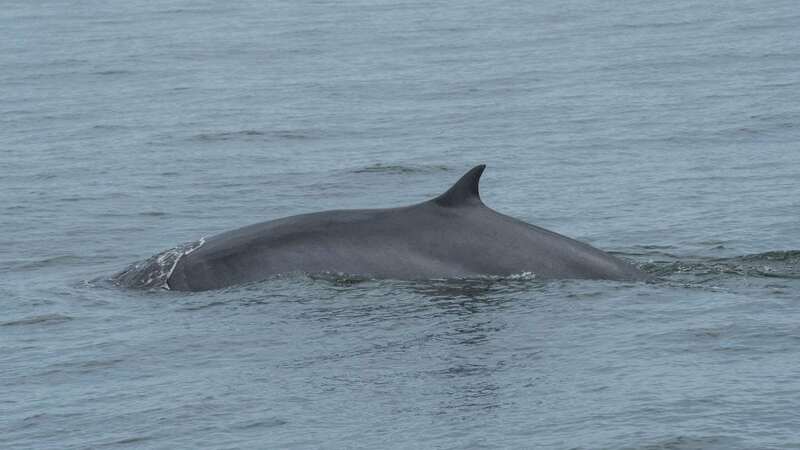 Noise pollution – Bryde’s whales rely on sound to navigate and communicate. Noise from military sonar, oil and gas drilling and exploration and shipping can disrupt and confuse them and even cause them to strand.